With so much momentum around real-time filmmaking, we know many of you are eager to try creating cinematic scenes with the latest best practices for fast iteration and powerful storytelling workflows. For users looking to get started using Unity for linear content such as cut-scenes for their games, short films, or other use cases, we published a Film Sample Project on the Asset Store. Mike Wuetherick is a Senior Producer on the Made with Unity team. His team has worked on a number of large cinematic projects over the past 2 years, including the Oats Studios ADAM Episode 2 & 3 shorts, and most recently the Baymax Dreams collaboration with Disney Television Animation. This package contains an example Unity project preconfigured for anyone interested in creating linear content, such as short films or even an animated series. It uses layout tips from how projects like Adam 2: The Mirror and Baymax Dreams shorts were created, and also serves as a starting point for creating your own cinematic project in Unity. The project uses the new HD Scriptable Render Pipeline, Post Processing Stack V2, Timeline, Cinemachine and includes a number of additional editor utilities, custom timeline tracks, and other useful tools that we’ve built while working on linear productions with Unity. You can find the Film Sample Project on the Unity Asset Store. In order to get started with the Film Sample, you’re going to need a copy of Unity installed. This project was created with Unity 2018.2, and it should work with any 2018.2.x or 2018.3.x version of Unity. 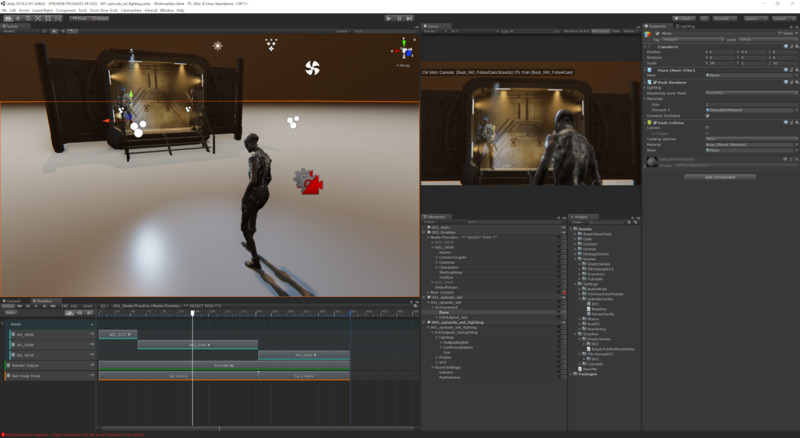 Once you have Unity installed, create a new Empty project using the High-Definition RP template, and then navigate to the asset store and import the Film Sample project. Note: the Film Sample is a complete Unity project, which means that it should be imported into an empty project. Basic project structure and organization, including a custom Unity editor window layout designed specifically for working on linear productions (for example, Timeline window is visible by default). Note: the three characters are provided with rigs modified by Oats Studios for the Adam Ep.2 and Ep.3 shorts, based on the version previously released in the ADAM 1 Character pack by Unity’s Demo team, which uses the Unity Humanoid Rig. The Airlock environment assets were created by Virtuous Games for Oats Studios, and the Motion Capture was shot at Animatrik studios. The characters, content, and scenes are from the Adam 2: asset pack, and are copyright Unity Technologies, Aps. All of the content for the Film Sample project is organized using a specific folder structure, shown below. It is recommended that you organize your content similarly. The section below will describe how to configure the scene framework for your own projects. All 3d models, animations, characters, props, audio etc are located under this folder. Includes the scenes for the samples & tutorials. Includes the Timeline sequences for the sample episodes. The Film Sample includes 2 sample scenes for you to use, as well as a number of tutorial scenes that demonstrate specific concepts in Timeline and Cinemachine for you to use in your own productions. The first sample scene is pre-built and uses some of the assets from the ADAM Episode 2 short to show how you can organize your content, Unity Scenes and Timeline to create your own production. The second sample scene is an empty scene with pre-created Timeline sequences, designed for you to start building your own sequences from scratch! To load the sample scenes, navigate to the Scenes folder in the Unity project. As shown in the screenshot below, you will see a number of folders under Scenes. The sample scenes are located in the EmptySeries and FilmSampleV1 folders. If you open the Film Sample V1 sample scene you will be presented with the setup shown in the header image at the top of the blog. This sample includes three shots from ADAM: Episode 2, and demonstrates using Timeline with Nested Timelines, as well as a couple different ways to approach creating cameras for your shorts — one with only Cinemachine, and one that shows the original mocap cameras that were created by Oats for the original shorts. If you navigate to the Scenes/EmptySeries folder, you will find a corresponding scene for the Empty example. You can use this sample as the starting point for creating your own custom production! The Film Sample includes many other tools, custom Timeline tracks, editor shortcuts and other utilities designed to make creating linear productions like ADAM easier. Check the FilmSample Readme file included in the project for more information. This video tutorial guides you through the full workflow of recreating the Film Sample V1 scene from scratch. This will give you the knowledge you need on the workflows and Unity tools that will enable you to create your cinematic content. We look forward to seeing what you create! Thanks for the feedback all, we have submitted an updated package that should the issues with the analytics package that were being reported previously. Thanks for your patience! This is likely because of script errors from something else (possibly related to the issues other people have reported). An updated package is up on the asset store that should correct this! This mentioned Unity Analytics are needed. I made a new empty project without analytics and I got some errors. Then I greated empty project with analytics included then everything worked fine. So somehow Analytics module is required. Interesting. That should not be the case. I see Mike W investigating below. An updated package is up on the asset store that should correct this! “com.unity.modules.unityanalytics”: “1.0.0” line is missing from manifest.json generating 2 compile errors. Someone else mentioned this as well, I’ll have to dbl check what could possibly depending on this – don’t know why the Analytics module would be required? Did you import the package into an empty project? if so, which template did you use to create the empty project? Thank you Team Unity, I just started working on Cinemachine for cinematic for my game and boom a full example project is here for my ease. – keyframe compression is enabled, causing all the character’s feet to slide around! What great timing; I am currently spending time doing some tinkering with Timeline & CineMachine.